Art watchers are scratching their heads after a Reuters photo surfaced Wednesday showing a massive Marilyn Monroe sculpture headed to its final resting place in a dump in the Guigang prefecture of southern China. If the 26-foot tall sculpture of Monroe striking her iconic pose from "The Seven Year Itch" looks familiar, that's because the stainless steel piece is almost an exact knockoff of American artist Seward Johnson's "Forever Marilyn," which has drawn international attention on exhibition in the U.S.
"It is definitely not a Seward Johnson sculpture," Paula Stoeke, director of Santa Monica-based Sculpture Foundation, which exhibit's Johnson's work, told The Huffington Post via email. "The Sculpture Foundation was surprised to see the photo and is researching it now." Local Chinese media reported the Marilyn imposter stood outside a Guigang business center for just six months before it was taken to a garbage collecting company earlier this week "for unknown reasons," Reuters said. NBC reports the Johnson knockoff was made by several Chinese artists over two years. 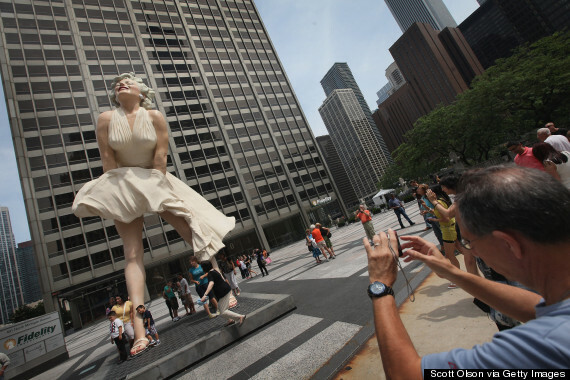 Johnson's authentic Marilyn Monroe sculpture stood for two years in downtown Chicago, where it was often reviled (and repeatedly vandalized) before it was moved to Palm Springs in the spring of 2012. The original sculpture is currently on display in its "birthplace" of New Jersey for a months-long retrospective of Johnson's career. 1 Gustav Klimt's "The Kiss"
Obviously you are a romantic, one who dreams of traveling the world, eating fine foods and probably falling in love with an opera singer. Or, you're just attracted to shiny things like gold, and you owned too many college dorm posters. 2 Vincent van Gogh's "Starry Night"
You are a quiet intellectual who enjoys spending nights in... gazing out windows perhaps? You are exhausted with the use of the term "introvert." You may or may not be pursuing an unrequited love interest. And the object of that love interest is probably sunflowers. 3 Edvard Munch's "The Scream"
"Laid back" is not a term people would use to describe you. You can often be seen finishing work in the wee hours of the night, complaining to friends by daylight that you're "so busy" and "stressed." You're making this face right now, aren't you? You have extravagant style, a dominant speaking voice and an impetuous attitude overall. You utter the words "Why Not?" more than the average individual. If faced with the decision of which pet to buy, your brain goes straight to monkey. 5 Leonardo da Vinci's "Mona Lisa"
You've read too many thrillers that sensationalize art history, so much so that you've embarked upon your own quest to solve the mystery of this woman's smirk. This is, therefore, not the first time you've gazed upon her face today. We fear your undeterred resolve. Mainstream [insert anything here] is just not for you. Your friends consider you a source of information for things indie, alternative and artsy. You make a lot of mixed tapes. And your next choice for favorite artwork would have been anything by Keith Haring. Well done, you. 7 Georgia O'Keeffe's "Pink Tulip"
Your desert island check list: a good book, a strong cup of tea and an iPod stocked with a few hours of classical music. Or just this painting. This painting would do. 8 Jackson Pollock's "Number 19"
You thrive in chaos. You eat while driving, read magazines backwards and need to have at least one layer of clutter around the house to feel comfortable. But hey, it works. 9 Salvador Dali's "The Persistence of Memory"
You are the type of person who feels very comfortable sharing vivid details from your slightly horrific dreams to the chagrin of every single one of your friends. You have inhaled. You have exhaled. And then you repeated the process a couple times for good measure. Your biggest secret: You've more than once contemplated a singing career because, hey, your voice sounds really good echoing through the halls of empty staircases. 11 Hieronymus Bosch's "The Garden of Earthly Delights"
Oddball, horse of a different color, strange bird. There are more than a few phrases to describe the special brand of "you." But you don't care. Because you're too busy examining the 50 shades of crazy happening in this painting! Amiright? You're a contrarian with a quick wit. If Magritte's "Ceci n'est pas une pipe (This is not a pipe)" was on this list, you would have picked that. In fact, you pick that anyway. 13 Katsushika Hokusai's "The Great Wave off Kanagawa"
Because who doesn't love a good early 19th century woodprint? Seriously, everyone loves this artwork, they just do. You have muttered the word "obvious" about 13 times throughout the course of reading this list. You love Cindy, but she's not even your first choice for favorite contemporary artist. 15 Damien Hirst's "The Physical Impossibility of Death in the Mind of Someone Living"
You've never been to a museum. But you do have a morbid fascination with animals in vitrines. 16 Barbara Kruger's "We Don't Need Another Hero"
You're reading this list from the study room of your college humanities department. Your coffee mug features either the visage of Notorious RBG or reads "eschew obfuscation." 17 Kara Walker's "A Subtlety"
You either enjoy massively popular art shows in Williamsburg, regardless of the content, because, well, this makes for a great 'gram. OR you are acutely aware of the surreal history hidden behind this 75-foot long sculpture and, for the record, hate selfies. Polka dots, need we say more? Go home, friend, you're drunk.